Welding inspectors have a responsibility to the company they work for and the general public to ensure that weld quality is satisfactory. Failure to fulfill their duties can result in property damage, injury, and death. Most welding inspectors, therefore, take their job very seriously. 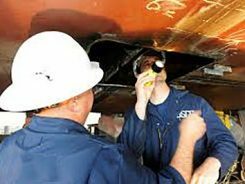 Welding inspectors spend years honing their ability to detect and size welding discontinuities and defects. While they must be proficient at identifying all discontinuities and defects, some of these weld irregularities are more readily detectable than others. Porosity is gas that has been trapped in the weld; this results in cavity formation within the weld. Porosity can cause reduced weld strength. Welding inspectors who are not trained in other forms of nondestructive testing are limited to viewing the surfaces of welds. So while not all forms of porosity can be detected by a welding inspector, porosity that extends to the surface of the weld can.